Alvin (hanging from ship above) was used in the search. RALEIGH, N.C. — Scientists using underwater vehicles and sonar have found a shipwreck off the North Carolina coast that may date back to the American Revolution, Duke University said Friday. 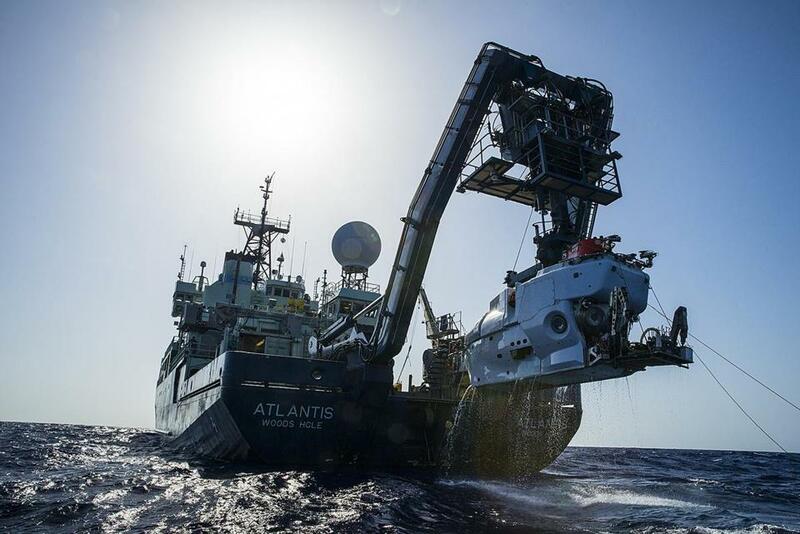 The expedition led by Duke marine scientist Cindy Van Dover found the wreck in mile-deep waters on July 12, using an underwater robot and a manned submarine. They’ve found artifacts including an iron chain, glass bottles, a pottery jug, and navigational instruments including a compass. Archeologists say the wreck appears to date back as far as the late 1700s . The scientists’ primary mission is studying deep-sea ecosystems. The expedition also includes scientists from North Carolina State University and the University of Oregon aboard a vessel from the Woods Hole Oceanographic Institution. The wreck was found using Woods Hole’s unmanned vehicle Sentry and the manned submarine Alvin.